Chair Massage Vancouver :: Simply Relax On Site Seated Massage your Golf Tournament Chair Massage Event Specialists. A proven crowd pleaser, chair massage will help make your event even more memorable. Our experience and expertise in mobile massage makes us the easy choice for your golf event. Simply Relax's customized golf massage will never affect the pace of play of the round. At the hole massages are kept under 5 minutes targeting the stiff spots such as the shoulders and back helping the players to renew thier energy. With rejuvenated muscles they may even be able to lower their handicap. Use Simply Relax's onsite massage as a well deserved reward after the tournament. Our practitioners will soothe sore and tired muscles leaving the players feeling happy and rejuvenated. We have had the pleasure of having Nia and the Simply Relax team at our corporate golf tournament for two years in a row now. The level of service and quality massages do not disappoint! Nia and her team are very professional and flexible, which definitely makes them easy to work with. We have merged the massage services with our sponsorship package and the Simply Relax team even offered to wear logoed tee shirts provided by our Massage Sponsor. We utilized the massage tent for both the pre-game warm up as well as the mid-game refresher and the service was very popular at all times of the day. Because the massages are quick (about five minutes per golfer) the pace of the game is not disrupted at all and the golfers leave refreshed and energized for the rest of the game! The feedback we have received from the golfers is astounding, and we will definitely be having the Simply Relax team back next year! 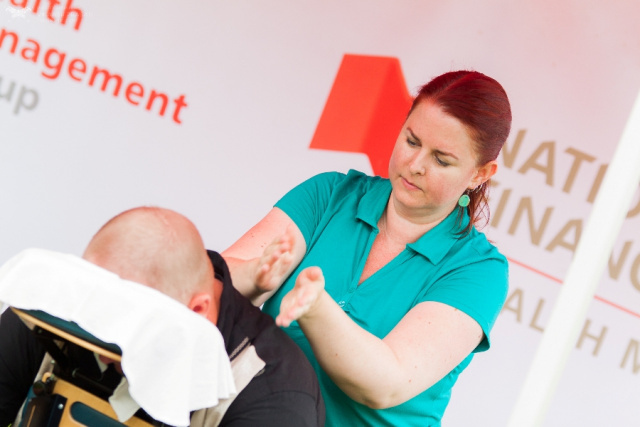 The Simply Relax team did a very professional job in providing chair massages at our client’s golf tournament. The golfers raved about it! Deborah Jones, President, DM Jones & Associates Inc. A A A prWantThe Simply Relax team did a very professional job in providing chair massages at our client’s golf tournament. The golfers raved about it! Deborah Jones, President, DM Jones & Associates Inc. Copyright © 2008 Nia Bellamy. All rights reserved.